MAPS™ ISDN Software Ver 4.9.19 | Download Now! The Integrated Services Digital Network (ISDN) system allows voice, data and video to be transmitted simultaneously across the world using end-to-end digital connectivity. ISDN, based on the telephony network, was conceived to provide multiple voice and non-voice services over a single network and a digital user network interface over regular phone lines, instead of dedicated and isolated user-network interfaces. GL’s MAPS™-ISDN is an advanced protocol simulator/tester for ISDN simulation over TDM (T1 E1) and generates high volumes of ISDN traffic. The tester can simulate ISDN signaling as defined by ITU-T Q.931, 5ESS, 4ESS, BELL, DMS-100, DMS-250, and QSIG ECMA standards. MAPS™ application can also emulate signaling as per Q.921, referred to as LAPD (Link Access Protocol - D Channel), a Data Link protocol used over ISDN's D channel. This test tool is used to perform testing using ISDN and LAPD protocol messages over T1/E1, and offers a complete solution for testing, troubleshooting, and maintenance of devices and networks implementing PRI ISDN. MAPS™-ISDN also incorporates the flexibility to modify ISDN and LAPD call parameters & message contents (arbitrary manipulation of messages, information elements and message sequence on the different protocols). This flexibility ensures that the MAPS™-ISDN communicates with the system under test. 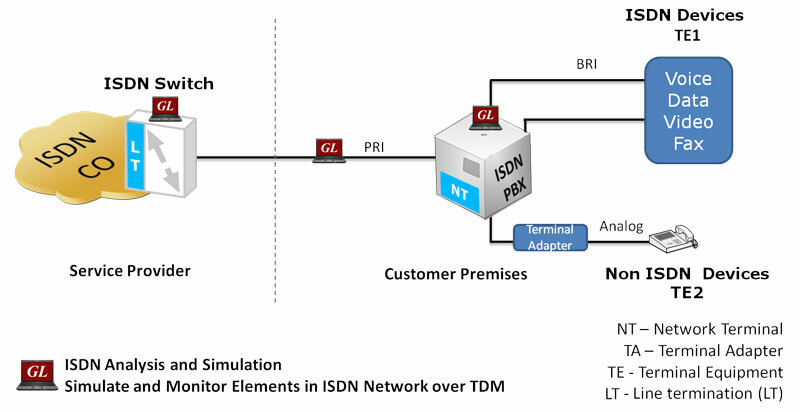 It is even possible to emulate a complete ISDN connection (switch to subscriber) all in the same PC with a dual interface card or dual portable analyzer unit. The application is enhanced to support ISDN and LAPD conformance test suite to provide reliable communication over the network. MAPS™ ISDN and LAPD Conformance test suite is a product that helps service providers to check their ISDN network for conformity to its standard specifications - ITU-T Q.931 for ISDN and Q.921 for LAPD. The ISDN Conformance test suite is used to conform various ISDN and LAPD call states over T1 E1, offering a complete solution for testing, troubleshooting, and maintenance of devices and networks implementing PRI ISDN. It is useful to test ISDN products designed for either U or S/T interface, including network terminations, Type 1 terminating equipment, and terminal adapters. The application supports powerful utilities like Message Editor and Script Editor which allow new scenarios to be created or existing scenarios to be modified using ISDN messages and parameters. GL also provides a GUI based ISDN protocol analyzer (optional application – xx100) for on-line capture and decode of the signaling in real-time both during tests and as a stand-alone tracer for live systems. Access to LAPD SABME, UA, RR, DISC signaling messages at layer 2. Verification and Validation of protocol related timers. Verification of Re-Transmission of messages in a given state. MAPS™ ISDN is configured as both Subscriber and at the network end as Switch simulating the ISDN signaling call and handling TDM traffic – voice, file, digits, VF, FAX, IVR over the established call. The following screen shows MAPS™ LAPD emulator configured to simulate LAPD signaling messages at both User and Network terminals in the network. As an example, the conformance script below is used to test the Null State of the DUT. The DUT in the Null call state, on receipt of a RELEASE COMPLETE message, is expected to send no message and remain in the Null call state. The MAPS™ then sends status enquiry to the DUT to conform the Null State. The loaded lapd TEI assign call state conformance script verifies that the DUT (Subscriber) sends either UA/ DM message in response to SABME from switch. The DUT (Subscriber) is expected to be either in Multiple Frame Established state (7.0) or TEI Assigned state (4.0) after sending the response.